Colorwheel Blossom is Finished! | OccasionalPiece--Quilt! Posted on December 16, 2014 by Elizabeth E.
This was the quilt top in April 2014, held aloft by my husband. Then it went AWOL for a while, as I’ve mentioned before. Realizing it was do-or-die time, I printed out several of these “faded” photos to doodle on, to try out quilting. I thought about quilting it all in lines, a la “the hard-edge industrial look,” but I wanted it to represent garden, blossom, flower, soft, and fragrant more than I wanted it to look like it had been scraped by a saw. I’ve read lots of print articles about how to quilt a quilt. What they don’t tell you is that starting to quilt a quilt takes massive doses of courage. Gigantor-sized, even. Sketching it out helps me visualize what I’m doing and sparks that bit of courage to get going. Matching the colors, section by section. Where did I get this idea? Look on your iPhone home screen for the Photos button. I needed to draw on the feathery components with my marker. That’s called Finding More Courage. I don’t know why I thought you had to just go at it without marking anything. Marking (in blue for longer time and purple for shorter time) is my new best friend. Just keep it away from the iron and out of the sun. I loved seeing the quilting in the last light of day, the deep shadows calling the stitching into relief. Another Courage-Enhancer. The last two pictures are shots taken outside, for its formal portrait. The backing fabric is Wild Garden by Dan Bennett, for Rowan/Westminster Fibers. Now you can see my hanging system! This quilt was a turning point for me, in terms of gaining skills for free-motion quilting. I learned about marking, about when to mark. I slowed down, remembering what my teacher this summer used to say when she’d watch me: “Elizabeth. Be more deliberate.” It helped to repeat that often as I stitched, and helped me avoid many of my earlier mistakes. I learned to depend on the wisdom available through social media. 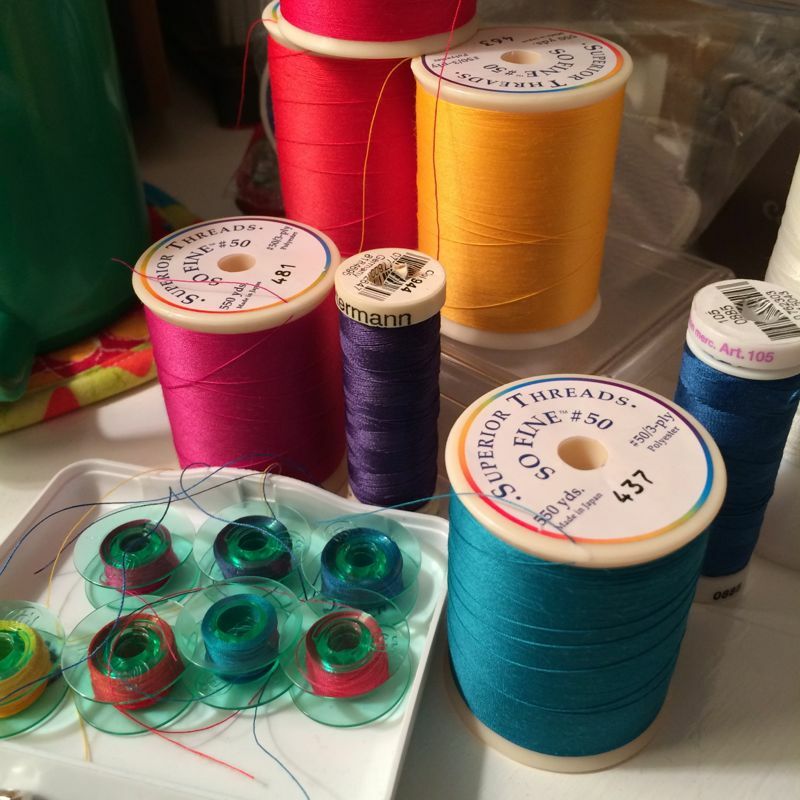 Two quilters on IG, Linda, of Flourishing Palms and Leslie, of PlainandFancy were always there with tips and tricks. But without all the lovely likes and happy face-emoticons and positive comments from all the readers, I wouldn’t have been so courageous, I’m sure. It was if after every quilting session, all the fans in the bleachers around my sewing room would stand up and cheer me on. So gratifying, especially as I felt like I was on thin ice most of the time. One day in the mail, a card arrived. It was my father’s stationary, my address written in his bold Montblanc pen, which in this note he called his Meisterstuck. My father has been one of my best cheering sections in my life, right along with my mother and my husband. I’ve written about my father before, his courage in renting himself a studio after he retired and pulling out paints and brushes, a good example to all his seven children. 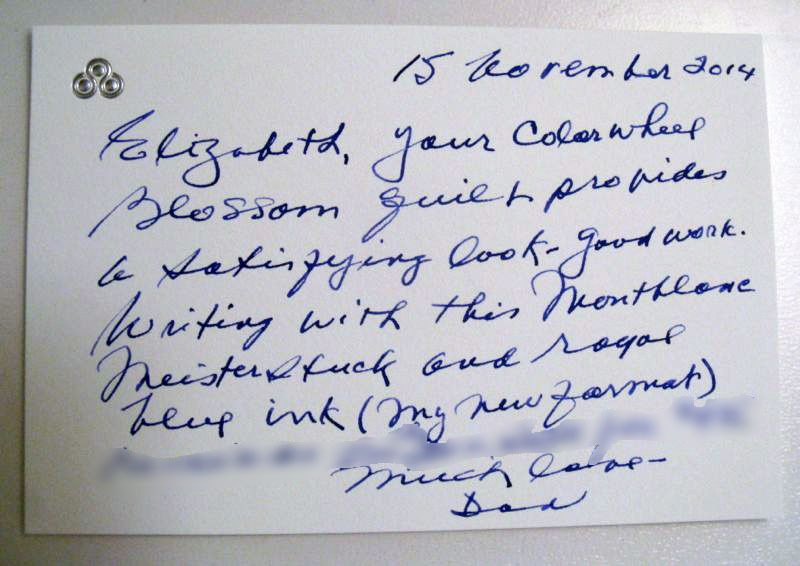 His brief, descriptive note now hangs near my sewing machine, reminding me that my work extends sometimes far beyond my little room, far beyond my own little place. And, on this day in December, I honor him: Happy 89th Birthday, Dad! You are a treasure. Because of you, Dad, because of so many people, and because the creative urge is made manifest in me through quilting, Colorwheel Blossom is finished, and is hanging in my hallway. It’s a nice feeling to walk by, letting my fingers run across the soft trellising, the vines and flowers. It brings a smile to my face as I pass by this garden. Bravo, Elizabeth!!!!! So worth all the angst and effort. And I’m so happy that you walk past it in the hall and swoon; too often I think we power through the difficult and then speed past or around the memory, tangible or otherwise, to avoid the pain. Possibly that directive “Elizabeth. Be more deliberate.” was the key. I think I’ll remember that! And belated wishes to your dad – mine would have turned 90 last week! Great post. Beautiful quilt and i love your writing about it! Colorwheel Blossom is gorgeous. I certainly share your sense of greater and greater angst as the quilt progresses and every new decision could ‘ruin’ the hard work. At least that’s what the little voice says. So hard to get past that, but so worth it. Congratulations! the quilt is amazing, but the story behind the quilt makes it out of this world!!!! Your quilt is just stunning. The quilting is the icing on the cake. 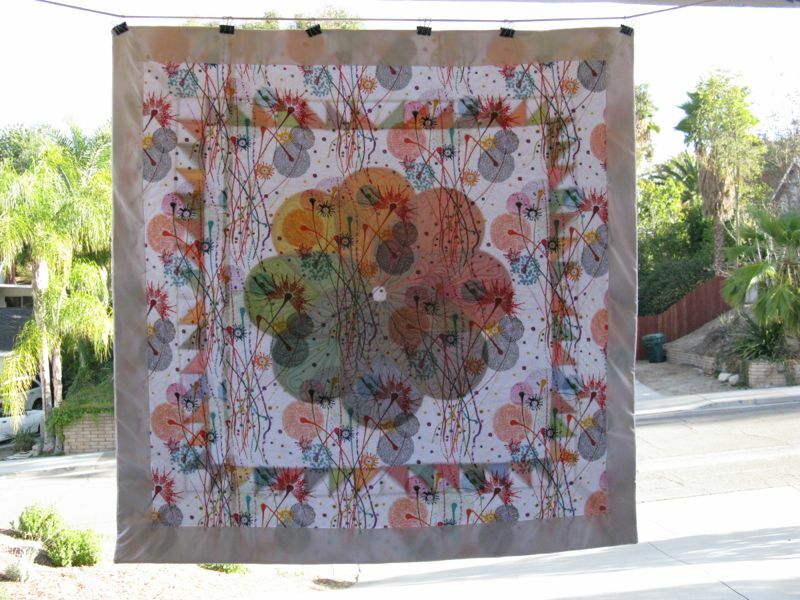 Matching the threads to the colors was a great idea as it truly enhances the quilting itself. I love the flower feeling that you have added – much better than the industrial look. Enjoy that beauty! Happiest of birthdays to your best cheerleader. I love the colorwheel, but even more I love your dad’s note and your tribute to him. Hooray! What an absolutely awesome and beautiful quilt, and so worth taking that risk of driving off the road! How wonderful that your dad is your biggest fan. I so wish I still had my father. I do love this quilt. 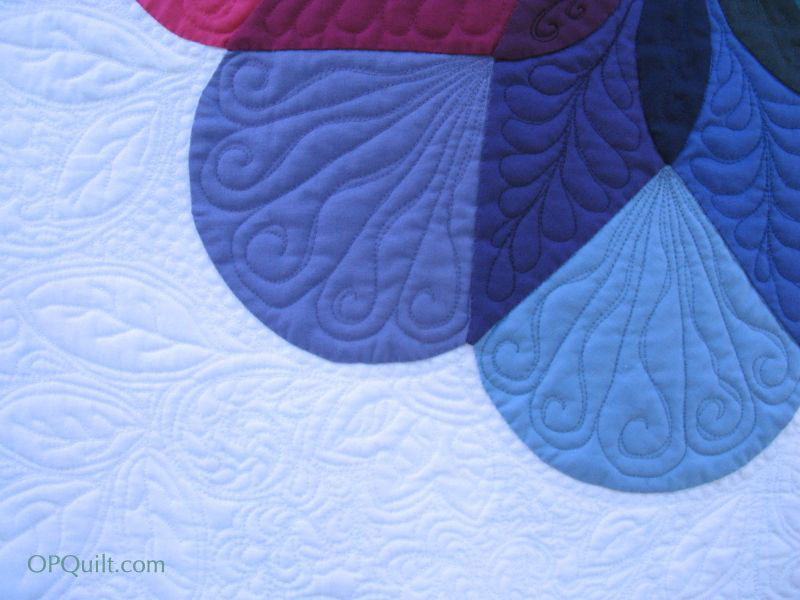 Your quilting is stunning! It was very fun to watch this quilt come together and then get quilted. It turned out beautiful. Such a great masterpiece. Love that your Dad loves it, too! Elizabeth, congratulations on a beautiful finish. I so appreciate how you’ve shared the step by step quilting of this quilt with us, starting from the center and working your way to the outside. And, I’m glad that you hung it where you can walk by it on a regular basis. Happy belated birthday to your dad. That comes with a pull in my heart. My dad, who has been gone for eleven years, would have turned 94 today. A beautiful tribute to dad. Maybe you should send a photo to Apple. I’m so proud of you! What a beautiful story, Elizabeth. 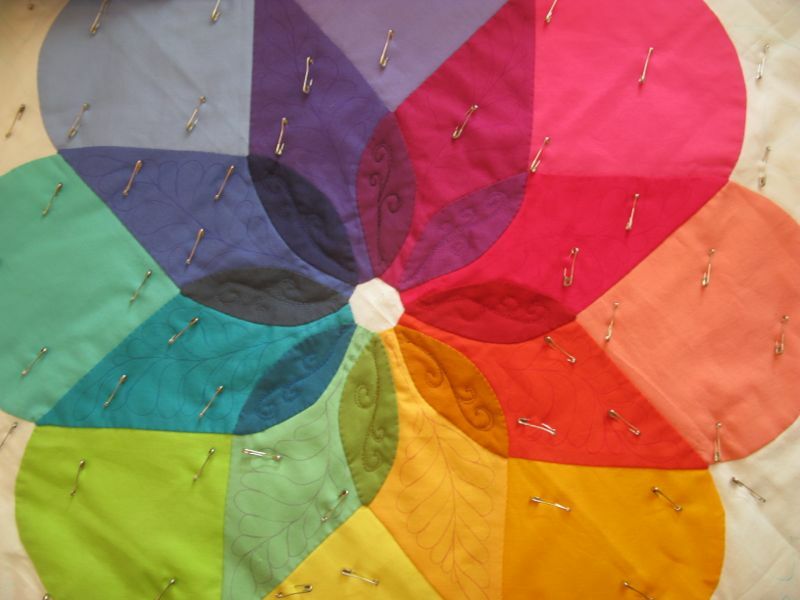 “The Tale of Colorwheel Blossom, and How it Came to Life.” You hit the nail on the head when you spoke about the courage it takes to start quilting. “Just” that hurdle to jump, and then you’re on your way, just as you proved. Marking is a good thing, and I’m glad to know you’re not using Frixion pens. I think you know to stay away from those! The best part of this whole quilt is the note of affirmation from your Dad. Oh my gosh! You are SO fortunate to have a parent who appreciates what you do. Bless his heart… at 89 too! I’m impressed with him, and happy for you. He’s definitely a treasure. This quilt will surely hold lots of memories within its layers – the making of it, and from the responses you’ve received. I hope you find a place to hang it to remind you of this one journey, of many, you’ve been on. Now keep on truckin’! 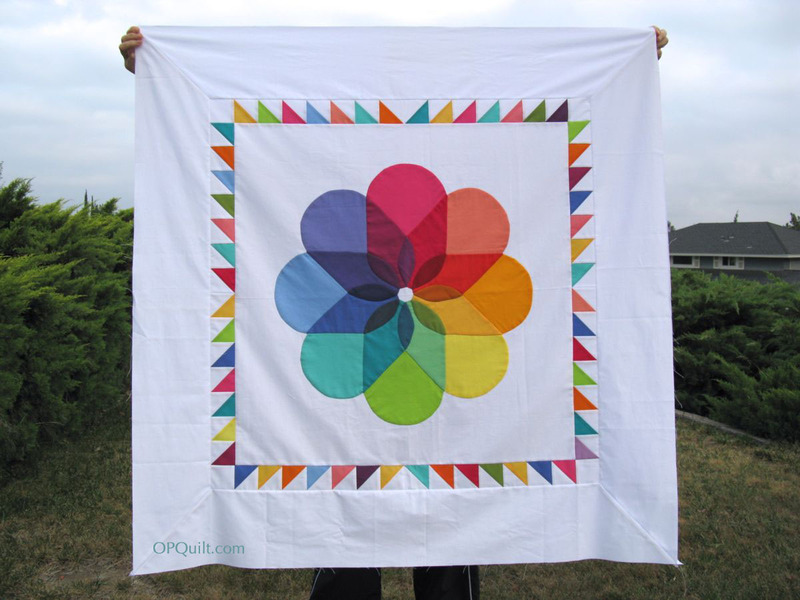 Dear Elizabeth,what an inspiring post, I absolutely love your quilt and especially the quilting, it is amazing, I am a hand quilter but this machine quilting I really love, it looks so unique especially in the white, I guess because you designed it yourself and didn’t just use a template. Wow wow wow! Well done and congrats!! Found it really interesting to see the designs, your planning on the photo, never though to do that. Great tip!! It’s just gorgeous, Elizabeth. You have much to be proud of. Oh my, how I identify with the fear of the leap from quilting “for practice on quilts that don’t matter” to quilting on a “real” designed quilt. I’m still practicing; I’ll return to reread this when I am ready to make the leap. And your quilting is perfectly integrated with your design. This is one to be especially proud of. 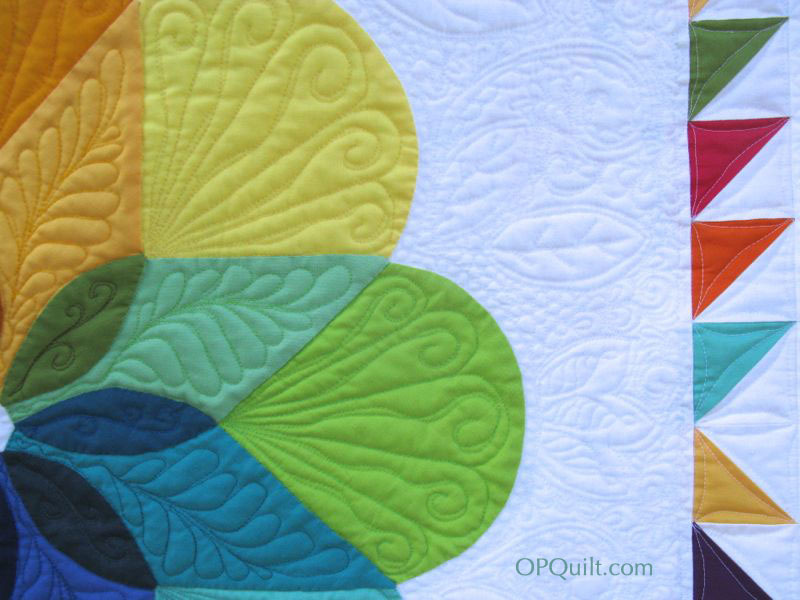 The colours and design are beautiful and the quilting is just the perfect compliment to the quilt. I love it! The quilt is fabulous, your writing is engaging and thoughtful, your process is inspiring and encouraging. Thank you for sharing! This is another quilt I hope we’ll revisit on occasion! Well done you must be so happy with this finish. I love the quilting that you have done on your quilt, the outside border with the cross-hatching with the flowers twined through is lovely, it just gives a little bit of a traditional twist to it. I like what your teacher said about being more deliberate, I really do think that quilting slower gives you more opportunity to think about what you are doing and you enjoy it more. What a nice post Elizabeth. I have enjoyed being on the journey with you to finish this one and love the final result. I also relate so well to your comment “starting to quilt a quilt takes massive doses of courage. Gigantor-sized, even” So so true. You must be one courageous quilter now. The note from your Dad is priceless too. It’s more than gorgeous, more than stunning, and more than incredible. Can you tell that I love this quilt?! 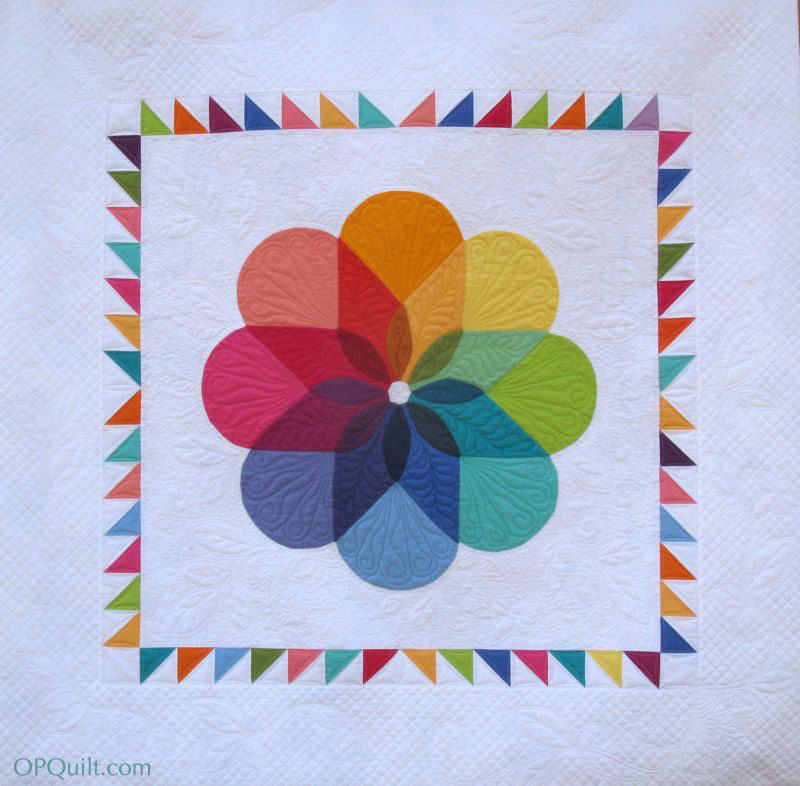 It was so much fun following along as you created this quilt! AMAZING QUILT! I love it! The quilting is perfect for it! It is truly show worthy. Isn’t Linda great? She used to live here in Iowa and we were in the same quilt guild. Just found your blog today, after seeing a picture of your Kaleidoscope quilt. Wonderful blog! Wonderful quilts! From the first time I saw the photo icon I wanted to make it into a quilt, but as I’m still new to quilting, wasn’t sure how to go about it. Yours is awesome! Thank you for sharing. Pingback: Pineapple Quilt Borders: Progress? | OccasionalPiece--Quilt! 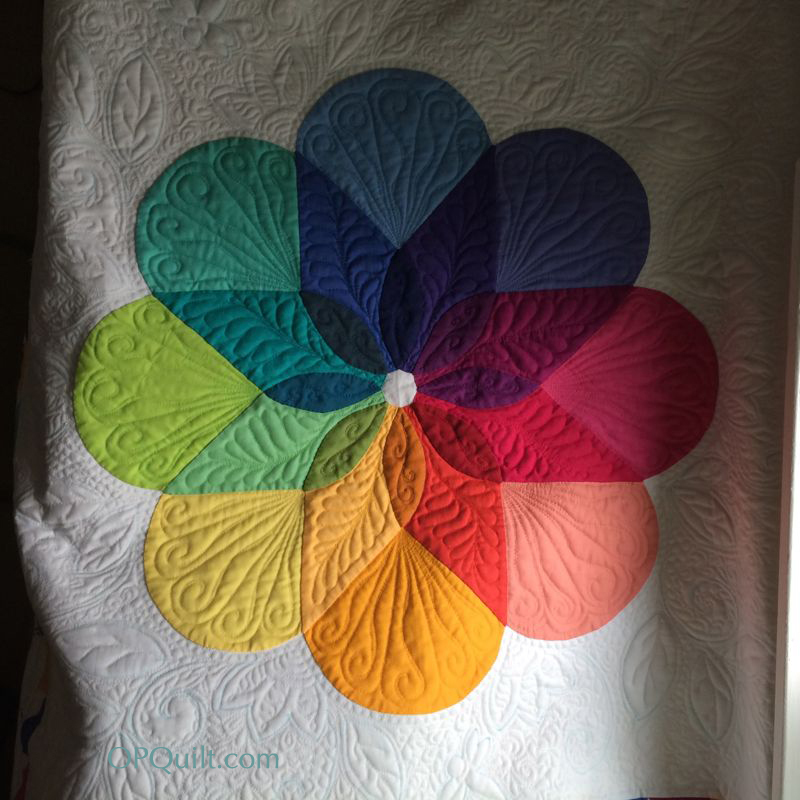 Pingback: Colorwheel Blossom–Blogger’s Quilt Festival | OccasionalPiece--Quilt! There are so very many quilts I admire and want to make – sometime in the future. The “Colorwheel Blossom” is at the top of the list by a mile, and I want to make it now. 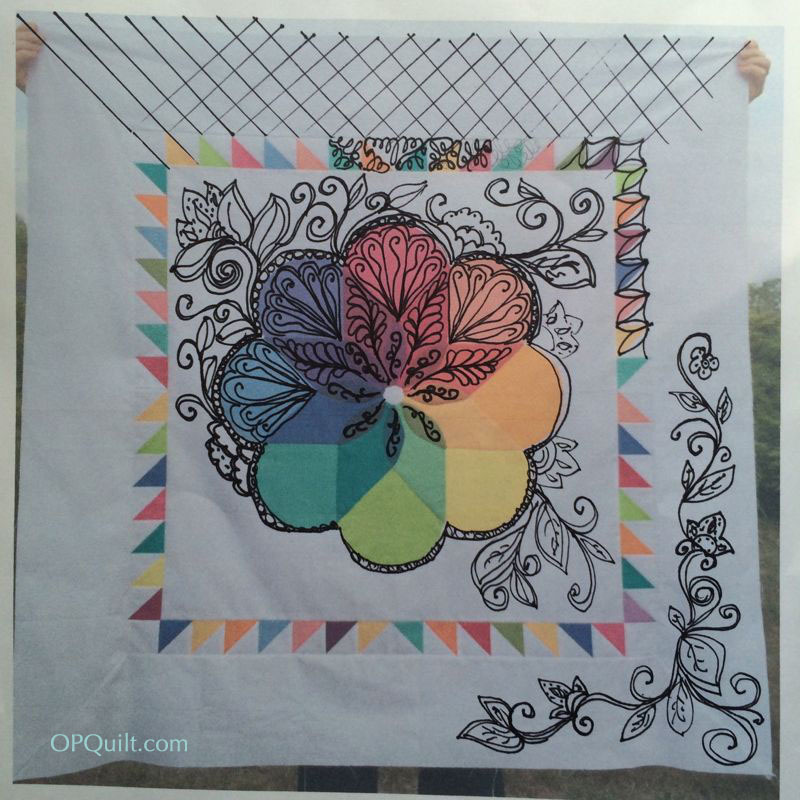 I hope you will either prepare a tutorial, pattern, or kit for this quilt. I too would love to have this hanging in my entry way as a way to welcome all visitor to my home. With the rainbow effect this quilt goes a long way to welcoming people from all walks of life. My quilt would be a treasure to cherish for ever, but never as impressive as your quilt with its unique quilting plus the fact it is strictly your own creativity which brought it to fruition. Your brilliance is certainly demonstrated through your quilting. Thank you so much for sharing your art..